Nestled between the Santa Ynez Mountains (within the Los Padres National Forest) and the Pacific Ocean, Santa Barbara offers a variety of outdoor activities, all within 30 minutes of downtown. It’s the perfect weekend getaway for efficiently cramming in as many adventures as possible. However, be prepared to rise early, go from one activity to the next, exhaust your muscles, and do it all over again the next day. This Southern California weekend isn’t about lounging on the beach all day and getting a good tan (although there is some of that). It’s about taking advantage of the area’s natural splendors in full, and we’ve prepared a 48-hour itinerary to help you get started. Hike Montecito Peak: Rise early and start your weekend adventure with a hike up Montecito Peak. Although not as popular as the hike to Inspiration Point, Montecito Peak is a good alternative for avoiding crowds, but still getting in a rigorous 7.1-mile out-and-back hike that’ll take up much of the morning. At 3,214 feet, Montecito Peak is one of the highest in the Santa Ynez Range and it provides breathtaking vistas of the surrounding city and Pacific Ocean. The hike starts on Cold Springs Trail, about 6 miles northeast of downtown Santa Barbara. One tip: Make sure to wear a hat and sunscreen, and bring plenty of water since most of the trail follows an exposed ridge with little to no shade. Lunch at The Brewhouse: After a 4-hour hike you’ve worked up an appetite. Head back to downtown Santa Barbara and chow down on top-notch sandwiches and burgers at The Brewhouse on West Montecito Street. Since it’s also a microbrewery, enjoy a selection of 20-plus beers, like the spicy Habanero Pilsner, with your meal. And, if you’re traveling with a dog on this trip, even Fido gets to choose from his very own "brew-dog" menu of chicken strips, steak bites, and dog biscuits with beef gravy. Santa Barbara Botanic Gardens: For a much more leisurely experience of Santa Barbara’s flora and fauna, take a stroll through the Botanic Garden. Explore on your own or with a docent to learn about the thousands of native California plant species, including redwood groves and meadows full of wildflowers within this 78-acre preserve. \ _Surf at Mesa Lane Beach: _ Catch some late afternoon waves to round out the day’s activities. Although Campus Point is well known for its epic waves (mostly during winter) and variety of beach breaks, Mesa Lane offers a more exclusive experience. This beach is tucked away between private homes at the end of the street through a set of stairs. While it’s completely open to the public, its hidden entrance helps to limit crowds and keep it a secret among locals who come here before and after work/school. Dinner: An entertaining evening awaits at The Lark, located in the Funk Zone district of Santa Barbara. This hip new restaurant sits adjacent to tasting rooms, a distillery and a guitar bar for a fun night of drinking, mingling, and eating. Instead of bread, The Lark serves artisanal popcorn as a complimentary appetizer before the main course that could be grilled lamb belly or braised octopus dishes. Complement your meal with a craft cocktail or two. Spend the Night: Santa Barbara features a wide variety of lodging options, including luxury resorts, contemporary hotels, neighborhood inns, affordable motel rooms, and charming B&Bs. Camping is also available if you’d like to spend the night on the beach. El Capitán State Beach is just 17 miles west of downtown, and it offers 140 campsites along the coast to enjoy the incredible views and surrounding trails. Go for a Run: Wake up and start the morning with a run on Cabrillo Boulevard. Start at the Santa Barbara Harbor and follow the palm trees along Cabrillo Boulevard south toward Montecito. Turn around at the Santa Barbara Zoo for a solid 5-miler. If you want to go a little longer, head in the opposite direction at the harbor onto Shoreline Drive toward Shoreline Park for an added 2.5 miles and change of urban beach scenery. Coffee & Brunch: After your run, head over to Rebar Coffee, just a few blocks from Cabrillo Boulevard on State Street. You’ll find a wide variety of coffee options, including some excellent cold-brews. You can grab sandwiches there as well. If you’d rather sit down for a big breakfast—and you may need it—Sambo’s on the Beach has been serving breakfast and lunch since 1957. Load up on a big stack of its famous buttermilk pancakes to fuel up for the day ahead. 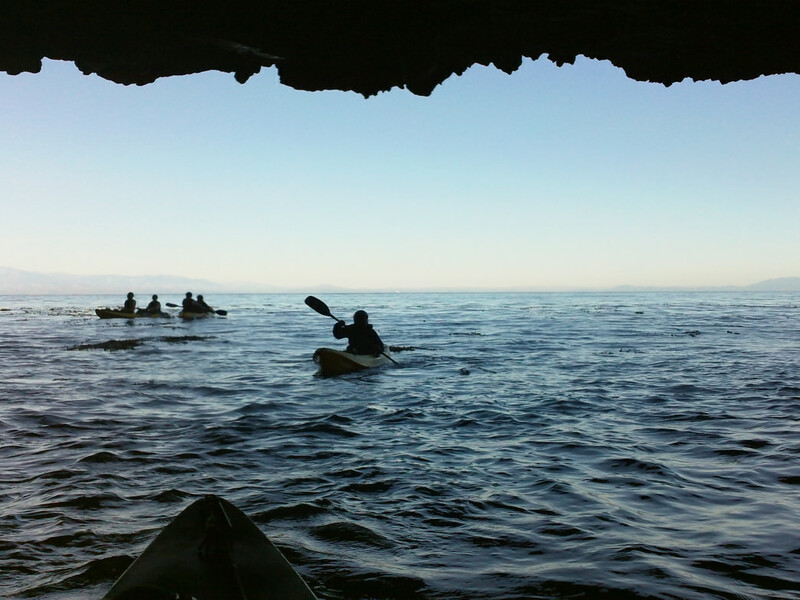 Sea Cave Kayaking the Channel Islands: The big adventure of the day takes place on the open sea. 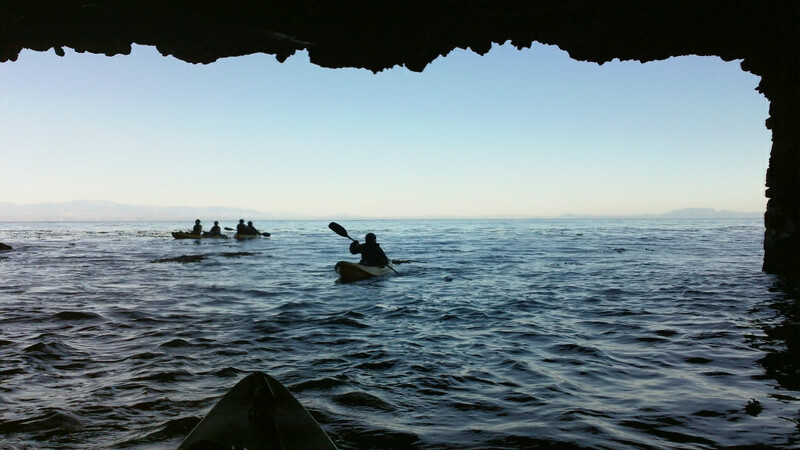 Head to Ventura Harbor where ferryboats can take you to Channel Islands National Park for a unique sea cave kayaking experience. Scorpion Anchorage along the island Santa Cruz’s coast has some of the most beautiful sea caves in the world. Experienced kayakers can bring or rent kayaks and make the trip on their own through Island Packer boats for an extra fee, but the Santa Barbara Adventure Company also offers guided group afternoon tours that start at 11 a.m. and end around 5 p.m.
Sunset at Butterfly Beach: Finally, drive back up the 101 to downtown Santa Barbara for a final evening in the American Riviera®. End the trip with the perfect sunset view at Butterfly Beach within the Montecito district. Unlike most of Santa Barbara’s south-facing beaches, Butterfly Beach faces the west. Thus, it’s one of the area’s best spots for watching magical sunsets that light up the sky in crimson pink and golden orange hues.